The last time I had a facial (thank you Groupon) my aesthetician told me I had a lot of sun spots on my cheeks and recommended laser treatments to remove them. Yes, I admit sunscreen was not really a priority as a teenager. My cheeks would ALWAYS burn. And we won't even discuss the burning/peeling on my chest. What was I thinking?? Before signing up for lasers I did a little online research and found a lovely all natural solution to minimize those blotches and freckles. 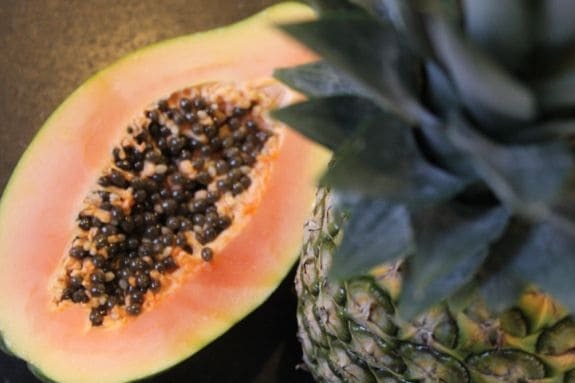 Unripe papaya contains natural alpha-hydroxy acids and high levels of papain, an enzyme that helps dissolve dead skin cells. Pineapple has lots of the enzyme bromelian, which helps remove the outer layers of skin to reduce age spots and wrinkles. Used together, the enzymes and AHAs in papaya and pineapple naturally exfoliate and lighten skin color. Yay! 1. Juice papaya and pineapple in juicer if you have one. If you don't have a juicer, you can mash the fruit together or put it in a blender. Strain out the pulp with fine mesh strainer or cheesecloth. 2. Gently wash your chest, neck and face. 3. 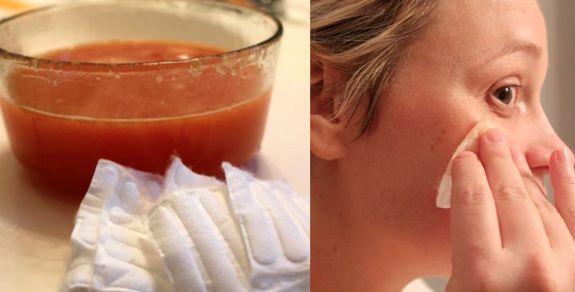 Use a cotton ball to apply juice to chest, neck and face. Avoid the eye area - yeah, it stings. You can also do the backs of your hands at the same time. 4. Lie down and let it work for 10-15 minutes. It will tingle and itch. This is the AHAs working so try not to scratch. 5. Rinse with warm water and moisturize. Again, I highly recommend coconut oil. If you want to try another easy mask (also from the kitchen) try this one with turmeric.